The first type, gauge anomalies, are red-flags: if they show up in your theory, they indicate that the theory is mathematically inconsistent. The second type of anomaly does not signal any problems with the theory and in fact can have experimentally observable consequences. A prime example is the chiral anomaly. This anomaly nicely explains the decay rate of the neutral pion into two photons. In this paper, a new anomaly is discussed. This anomaly is related to the polarization of light and is called the electromagnetic duality anomaly. Due to this symmetry the current density is conserved: . This then immediately tells us that the charge associated with this current density is time-independent. Since the chiral charge is time-independent, it prevents the fields to decay into the electromagnetic fields, because the field has a non-zero chiral charge and the photons have no chiral charge. Hence, if this was the end of the story, a pion would never be able to decay into two photons. From calculating how the chiral symmetry acts on the measure , one can extract all the relevant physics such as the decay rate. In other words, since this is a symmetry, if you plug this transformation into the Lagrangian of electromagnetism, the Lagrangian will not change: it is invariant. Now following the same steps as for the chiral anomaly, we find that the associated current is conserved and its charge is time-independent due to the symmetry. Here, the charge is simply the difference between the number of photons with left helicity and those with right helicity. Let us continue following the exact same steps as those for the chiral anomaly. The key is to first write electromagnetism in variables analogous to those of the chiral theory. Then you apply Fujikawa’s method and… *drum roll for the anomaly that is approaching*…. Anti-climax: nothing happens, everything seems to be fine. There are no anomalies, nothing! So why the title of this blog? Well, as soon as you couple the electromagnetic field with a gravitational field, the electromagnetic duality is broken in a deeply quantum way. The number of photon with left helicity and right helicity is no longer conserved when your spacetime is curved. Some potentially really cool consequences have to do with the study of light passing by rotating stars, black holes or even rotating clusters. These astrophysical objects do not only gravitationally bend the light, but the optical helicity anomaly tells us that there might be a difference in polarization between lights rays coming from different sides of these objects. This may also have some consequences for the cosmic microwave background radiation, which is ‘picture’ of our universe when it was only 380,000 years old (as compared to the 13.8 billion years it is today!). How big this effect is and whether we will be able to see it in the near future is still an open question. The beautiful book “Quantum field theory and the Standard Model” by Michael Schwartz has a nice discussion in the later chapters on the chiral anomaly. Lecture notes by Adal Bilal for graduate students on anomalies in general can be found here. What would gravity look like if we lived in a 6-dimensional space-time? Models of TeV-scale gravity theorize that the fundamental scale of gravity, MD, is much lower than what’s measured here in our normal, 4-dimensional space-time. If true, this could explain the large difference between the scale of electroweak interactions (order of 100 GeV) and gravity (order of 1016 GeV), an important open question in particle physics. There are several theoretical models to describe these extra dimensions, and they all predict interesting new signatures in the form of non-perturbative gravitational states. One of the coolest examples of such a state is microscopic black holes. Conveniently, this particular signature could be produced and measured at the LHC! Sounds cool, but how do you actually look for microscopic black holes with a proton-proton collider? Because we don’t have a full theory of quantum gravity (yet), ATLAS researchers made predictions for the production cross-sections of these black holes using semi-classical approximations that are valid when the black hole mass is above MD. This production cross-section is also expected to dramatically larger when the energy scale of the interactions (pp collisions) surpasses MD. We can’t directly detect black holes with ATLAS, but many of the decay channels of these black holes include leptons in the final state, which IS something that can be measured at ATLAS! This particular ATLAS search looked for final states with at least 3 high transverse momentum (pt) jets, at least one of which must be a leptonic (electron or muon) jet (the others can be hadronic or leptonic). The sum of the transverse momenta, is used as a discriminating variable since the signal is expected to appear only at high pt. This search used the full 3.2 fb-1 of 13 TeV data collected by ATLAS in 2015 to search for this signal above relevant Standard Model backgrounds (Z+jets, W+jets, and ttbar, all of which produce similar jet final states). The results are shown in Figure 1 (electron and muon channels are presented separately). The various backgrounds are shown in various colored histograms, the data in black points, and two microscopic black hole models in green and blue lines. There is a slight excess in the 3 TeV region in the electron channel, which corresponds to a p-value of only 1% when tested against the background only hypothesis. Unfortunately, this isn’t enough evidence to indicate new physics yet, but it’s an exciting result nonetheless! This analysis was also used to improve exclusion limits on individual extra-dimensional gravity models, as shown in Figure 2. All limits were much stronger than those set in Run 1. So: no evidence of microscopic black holes or extra-dimensional gravity at the LHC yet, but there is a promising excess and Run 2 has only just begun. 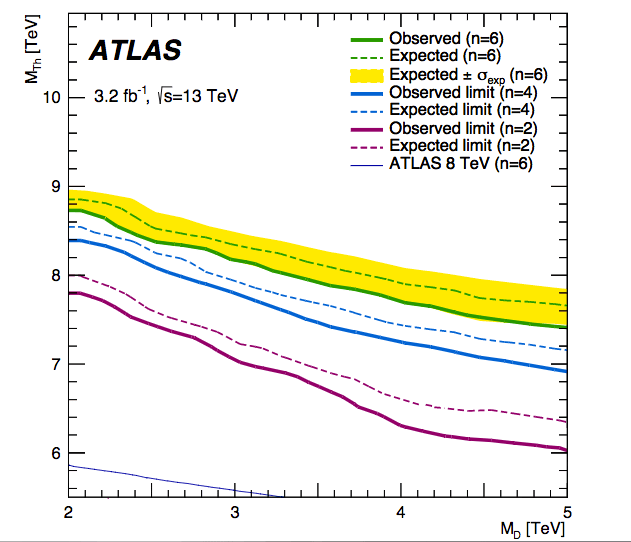 Since publication, ATLAS has collected another 10 fb-1 of sqrt(13) TeV data that has yet to be analyzed. These results could also be used to constrain other Beyond the Standard Model searches at the TeV scale that have similar high pt leptonic jet final states, which would give us more information about what can and can’t exist outside of the Standard Model. There is certainly more to be learned from this search! Can we measure black hole kicks using gravitational waves? On September 14 2015, something really huge happened in physics: the first direct detection of gravitational waves happened. But measuring a single gravitational wave was never the goal—.though freaking cool in and of itself of course! So what is the purpose of gravitational wave astronomy? The idea is that gravitational waves can be used as another tool to learn more about our Universe and its components. Until the discovery of gravitational waves, observations in astrophysics and astronomy were limited to observations with telescopes and thus to electromagnetic radiation. Now a new era has started: the era of gravitational wave astronomy. And when the space-based eLISA observatory comes online, it will begin an era of gravitational wave cosmology. So what is it that we can learn from our universe from gravitational waves? It was the first observation of a binary black hole system (with unexpected masses!). It put some strong constraints on the allowed deviations from Einstein’s theory of general relativity. What is next? We hope to detect a neutron star orbiting a black hole or another neutron star. This will allow us to learn more about the equation of state of neutron stars and thus their composition. But the authors in this paper suggest another exciting prospect: observing so-called black hole kicks using gravitational wave astronomy. So, what is a black hole kick? When two black holes rotate around each other, they emit gravitational waves. In this process, they lose energy and therefore they get closer and closer together before finally merging to form a single black hole. However, generically the radiation is not the same in all directions and thus there is also a net emission of linear momentum. By conservation of momentum, when the black holes merge, the final remnant experiences a recoil in the opposite direction. Previous numerical studies have shown that non-spinning black holes ‘only’ have kicks of ∼ 170 km per second, but you can also have “superkicks” as high as ∼5000 km per second! These speeds can exceed the escape velocity of even the most massive galaxies and may thus eject black holes from their hosts. These dramatic events have some electromagnetic signatures, but also leave an imprint in the gravitational waveform that we detect. Doppler shift from black hole kick. with v the kick velocity and n the unit vector in the direction from the observer to the black hole system (and c the speed of light). The black hole dynamics is entirely captured by the dimensionless number G f M/c3 with M the mass of the binary (and G Newton’s constant). So you can also model this shift in frequency by using the unkicked frequency fno kick and observing the Doppler shift into the mass. This is very convenient because this means that you can use all the current knowledge and results for the gravitational waveforms and just change the mass. Now the tricky part is that the velocity changes over time and this needs to be modelled more carefully. Mass during ringdown related to mass during inspiral. The results of doing this for a black hole kick moving away (or towards) us are shown in fig. 2: the wave gets redshifted (or blueshifted). The websites (LIGO / eLISA) of the ground-based gravitational wave interferometer LIGO and the large scale space mission eLISA have great descriptions about their mission and the science they do: worth checking out! After the chirp heard ‘round the world, the search is on for coincident astrophysical particle events to provide insight into the source and nature of the era-defining gravitational wave events detected by the LIGO Scientific Collaboration in late 2015. By combining information from gravitational wave (GW) events with the detection of astrophysical neutrinos and electromagnetic signatures such as gamma-ray bursts, physicists and astronomers are poised to draw back the curtain on the dynamics of astrophysical phenomena, and we’re surely in for some surprises. The first recorded gravitational wave event, GW150914, was likely a merger of two black holes which took place more than one billion light years from the Earth. The event’s name marks the day it was observed by the Advanced Laser Interferometer Gravitational-wave Observatory (LIGO), September 14th, 2015. 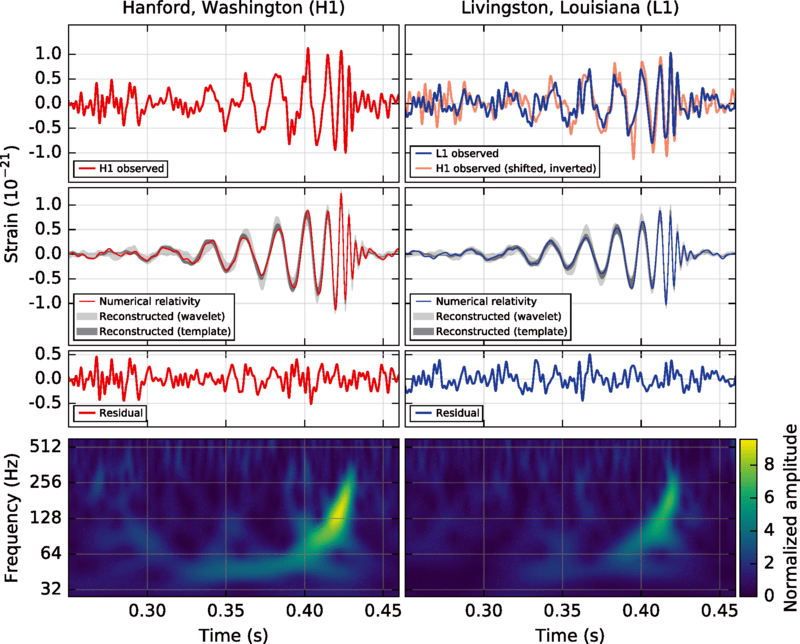 LIGO detections are named “GW” for “gravitational wave,” followed by the observation date in YYMMDD format. The second event, GW151226 (December 26th, 2015) was likely another merger of two black holes, having 8 and 14 times the mass of the sun, taking place 1.4 billion light years away from Earth. A third gravitational wave event candidate, LVT151012, a possible black hole merger which occurred on October 12th, 2015, did not reach the same detection significance a the aforementioned events, but still has a >50% chance of astrophysical origin. LIGO candidates are named differently than detections. The names start with “LVT” for “LIGO-Virgo Trigger,” but are followed by the observation date in the same YYMMDD format. The different name indicates that the event was not significant enough to be called a gravitational wave. Two black holes spiral in towards one another and merge to emit a burst of gravitational waves that Advanced LIGO can detect. Source: APS Physics. The following computer simulation created by the multi-university SXS (Simulating eXtreme Spacetimes) project depicts what the collision of two black holes would look like if we could get close enough to the merger. It was created by solving equations from Albert Einstein’s general theory of relativity using the LIGO data. (Source: LIGO Lab Caltech : MIT). Observations from other scientific collaborations can search for particles associated with these gravitational waves. The combined information from the gravitational wave and particle detections could identify the origin of these gravitational wave events. For example, some violent astrophysical phenomena emit not only gravitational waves, but also high-energy neutrinos. Conversely, there is currently no known mechanism for the production of either neutrinos or electromagnetic waves in a black hole merger. 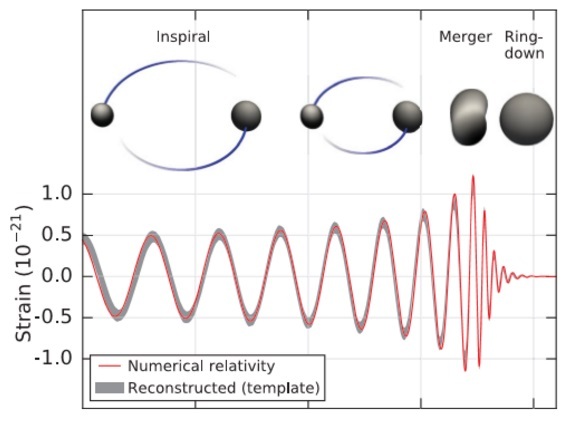 Black holes with rapidly accreting disks can be the origin of gamma-ray bursts and neutrino signals, but these disks are not expected to be present during mergers like the ones detected by LIGO. For this reason, it was surprising when the Fermi Gamma-ray Space Telescope reported a coincident gamma-ray burst occurring 0.4 seconds after the September GW event with a false alarm probability of 1 in 455. Although there is some debate in the community about whether or not this observation is to be believed, the observation motivates a multi-messenger analysis including the hunt for associated astrophysical neutrinos at all energies. Could a neutrino experiment like KamLAND find low energy antineutrino events coincident with the GW events, even when higher energy searches by IceCube and ANTARES did not? KamLAND, the Kamioka Liquid scintillator Anti-Neutrino Detector, is located under Mt. Ikenoyama, Japan, buried beneath the equivalent of 2,700 meters of water. It consists of an 18 meter diameter stainless steel sphere, the inside of which is covered with photomultiplier tubes, surrounding an EVOH/nylon balloon enclosed by pure mineral oil. Inside the balloon resides 1 kton of highly purified liquid scintillator. Outside the stainless steel sphere is a cylindrical 3.2 kton water-Cherenkov detector that provides shielding and enables cosmic ray muon identification. KamLAND is optimized to search for ~MeV neutrinos and antineutrinos. The detection of the gamma ray burst by the Fermi telescope suggests that the detected black hole merger might have retained its accretion disk, and the spectrum of accretion disk neutrinos around a single black hole is expected to peak around 10 MeV, so KamLAND searched for correlations between the LIGO GW events and ~10 MeV electron antineutrino events occurring within a 500 second window of the merger events. Researchers focused on the detection of electron antineutrinos through the inverse beta decay reaction. No events were found within the target window of any gravitational wave event, and any adjacent event was consistent with background. KamLAND researchers used this information to determine a monochromatic fluence (time integrated flux) upper limit, as well as an upper limit on source luminosity for each gravitational wave event, which places a bound on the total energy released as low energy neutrinos during the merger events and candidate event. The lack of detected concurrent inverse beta decay events supports the conclusion that GW150914 was a black hole merger, and not another astrophysical event such as a core-collapse supernova. More information would need to be obtained to explain the gamma ray burst observed by the Fermi telescope, and work to improve future measurements is ongoing. Large uncertainties in the origin region of gamma ray bursts observed by the Fermi telescope will be reduced, and the localization of GW events will be improved, most drastically so by the addition of a third LIGO detector (LIGO India). As Advanced LIGO continues its operation, there will likely be many more chances for KamLAND and other neutrino experiments to search for coincidence neutrinos. Multi-messenger astronomy has only just begun to shed light on the nature of black holes, supernovae, mergers, and other exciting astrophysical phenomena — and the future looks bright. The exciting Twitter rumors have been confirmed! On Thursday, LIGO finally announced the first direct observation of gravitational waves, a prediction 100 years in the making. The media storm has been insane, with physicists referring to the discovery as “more significant than the discovery of the Higgs boson… the biggest scientific breakthrough of the century.” Watching Thursday’s press conference from CERN, it was hard not to make comparisons between the discovery of the Higgs and LIGO’s announcement. The Higgs boson was billed as the last piece of the Standard Model puzzle. The existence of the Higgs was predicted in the 1960s in order to explain the mass of vector bosons of the Standard Model, and avoid non-unitary amplitudes in W boson scattering. Even if the Higgs didn’t exist, particle physicists expected new physics to come into play at the TeV Scale, and experiments at the LHC were designed to find it. Similarly, gravitational waves were the last untested fundamental prediction of General Relativity. At first, physicists remained skeptical of the existence of gravitational waves, but the search began in earnest with Joseph Webber in the 1950s (Forbes). Indirect evidence of gravitational waves was demonstrated a few decades later. A binary system consisting of a pulsar and neutron star was observed to release energy over time, presumably in the form of gravitational waves. Using Webber’s method for inspiration, LIGO developed two detectors of unprecedented precision in order to finally make direct observation. Unlike the Higgs, General Relativity makes clear predictions about the properties of gravitational waves. Waves should travel at the speed of light, have two polarizations, and interact weakly with matter. Scientists at LIGO were even searching for a very particular signal, described as a characteristic “chirp”. With the upgrade to the LIGO detectors, physicists were certain they’d be capable of observing gravitational waves. The only outstanding question was how often these observations would happen. The search for the Higgs involved more uncertainties. The one parameter essential for describing the Higgs, its mass, is not predicted by the Standard Model. While previous collider experiments at LEP and Fermilab were able to set limits on the Higgs mass, the observed properties of the Higgs were ultimately unknown before the discovery. No one knew whether or not the Higgs would be a Standard Model Higgs, or part of a more complicated theory like Supersymmetry or technicolor. Answering the most difficult questions posed by the universe isn’t easy, or cheap. In terms of cost, both LIGO and the LHC represent billion dollar investments. Including the most recent upgrade, LIGO cost a total $1.1 billion, and when it was originally approved in 1992, “it represented the biggest investment the NSF had ever made” according to France Córdova, NSF director. The discovery of the Higgs was estimated by Forbes to cost a total of $13 billion, a hefty price to be paid by CERN’s member and observer states. Even the electricity bill costs more than $200 million per year. The large investment is necessitated by the sheer monstrosity of the experiments. LIGO consists of two identical detectors roughly 4 km long, built 3000 km apart. Because of it’s large size, LIGO is capable of measuring ripples in space 10000 times smaller than an atomic nucleus, the smallest scale ever measured by scientists (LIGO Fact Page). The size of the LIGO vacuum tubes is only surpassed by those at the LHC. At 27 km in circumference, the LHC is the single largest machine in the world, and the most powerful particle accelerator to date. It only took a handful of people to predict the existence of gravitational waves and the Higgs, but it took thousands of physicists and engineers to find them. Even the language surrounding both announcements is strikingly similar. Rumors were circulating for months before the official press conferences, and the expectations from each respective community were very high. Both discoveries have been touted as the discoveries of the century, with many experts claiming that results would usher in a “new era” of particle physics or observational astronomy. With a few years of hindsight, it is clear that the “new era” of particle physics has begun. Before Run I of the LHC, particle physicists knew they needed to search for the Higgs. Now that the Higgs has been discovered, there is much more uncertainty surrounding the field. The list of questions to try and answer is enormous. Physicists want to understand the source of the Dark Matter that makes up roughly 25% of the universe, from where neutrinos derive their mass, and how to quantize gravity. There are several ad hoc features of the Standard Model that merit additional explanation, and physicists are still searching for evidence of supersymmetry and grand unified theories. While the to-do list is long, and well understood, how to solve these problems is not. Measuring the properties of the Higgs does allow particle physicists to set limits on beyond the Standard Model Physics, but it’s unclear at which scale new physics will come into play, and there’s no real consensus about which experiments deserve the most support. For some in the field, this uncertainty can result in a great deal of anxiety and skepticism about the future. For others, the long to-do list is an absolutely thrilling call to action. With regards to the LIGO experiment, the future is much more clear. LIGO has only published one event from 16 days of data taking. There is much more data already in the pipeline, and more interferometers like VIRGO and (e)LISA, planning to go online in the near future. Now that gravitational waves have been proven to exist, they can be used to observe the universe in a whole new way. The first event already contains an interesting surprise. LIGO has observed two inspriraling black holes of 36 and 29 solar masses, merging into a final black hole of 62 solar masses. The data thus confirmed the existence of heavy stellar black holes, with masses more than 25 times greater than the sun, and that binary black hole systems form in nature (Atrophysical Journal). When VIRGO comes online, it will be possible to triangulate the source of these gravitational waves as well. LIGO’s job is to watch, and see what other secrets the universe has in store. Grad students can apply now for ComSciCon’18!